In a key milestone, technicians at the Kennedy Space Center (KSC) in Florida have attached the world’s largest heat shield to a pathfinding version of NASA’s Orion crew capsule edging ever closer to its inaugural unmanned test flight later this Fall on a crucial mission dubbed Exploration Flight Test-1 (EFT-1). One of the primary goals of NASA’s eagerly anticipated Orion EFT-1 uncrewed test flight is to test the efficacy of the heat shield in protecting the vehicle – and future human astronauts – from excruciating temperatures reaching 4000 degrees Fahrenheit (2200 C) during scorching re-entry heating. A trio of parachutes will then unfurl to slow Orion down for a splashdown in the Pacific Ocean. Orion is NASA’s next generation human rated vehicle now under development to replace the now retired space shuttle. The state-of-the-art spacecraft will carry America’s astronauts on voyages venturing farther into deep space than ever before – past the Moon to Asteroids, Mars and Beyond! “The Orion heat shield is the largest of its kind ever built. Its wider than the Apollo and Mars Science Lab heat shields,” Todd Sullivan told Universe Today. Sullivan is the heat shield senior manager at Lockheed Martin, Orion’s prime contractor. The heat shield measures 16.5 feet (5 m) in diameter. Lockheed Martin and NASA technicians mated the heat shield to the bottom of the capsule during assembly work inside the Operations and Checkout High Bay facility at KSC. “Holes were drilled into the heat shield from the inside to the outside at the structural attached points at the underside of the crew module,” said Jules Schneider, Orion Project manager for Lockheed Martin at KSC, during a recent exclusive interview by Universe Today inside the Orion clean room at KSC. “Then its opened up from the outside and bolted in place underneath. Closeout plugs made of Avcoat are then installed to close it up and seal the gaps,” Schneider explained. The heat shield is constructed from a single seamless piece of Avcoat ablator, that was applied by engineers at Textron Defense System near Boston, Mass. “They applied the Avcoat ablater material to the outside. That’s what protects the spacecraft from the heat of reentry,” Sullivan explained. The ablative material will wear away as it heats up during the capsules atmospheric re-entry thereby preventing the 4000 degree F heat from being transferred to the rest of the capsule and saving it and the human crew from utter destruction. Orion EFT-1 is slated to launch in December 2014 atop the mammoth, triple barreled United Launch Alliance (ULA) Delta IV Heavy rocket, currently the most powerful booster in America’s fleet. The Delta IV Heavy is the only rocket with sufficient thrust to launch the Orion EFT-1 capsule and its attached upper stage to its intended orbit of 3600 miles altitude above Earth – about 15 times higher than the International Space Station (ISS) and farther than any human spacecraft has journeyed in 40 years. At the conclusion of the two-orbit, four- hour EFT-1 flight, the detached Orion capsule plunges back and re-enters the Earth’s atmosphere at 20,000 MPH (32,000 kilometers per hour). “That’s about 80% of the reentry speed experienced by the Apollo capsule after returning from the Apollo moon landing missions,” Scott Wilson, NASA’s Orion Manager of Production Operations at KSC, told me during an interview at KSC. “Numerous sensors and instrumentation have been specially installed on the EFT-1 heat shield and the back shell tiles to collect measurements of things like temperatures, pressures and stresses during the extreme conditions of atmospheric reentry,” Wilson explained. The heat shield arrived at KSC in December 2013 loaded inside NASA’s Super Guppy aircraft while I was onsite. Read my story – here. The data gathered during the unmanned EFT-1 flight will aid in confirming. or refuting, design decisions and computer models as the program moves forward to the first flight atop NASA’s mammoth SLS booster in late 2017 on the EM-1 mission and more human crewed missions thereafter. Recently, the EFT-1 launch was postponed three months from its long planned slot in mid-September to December 2014 when NASA was ordered to make way for the accelerated launch of recently declassified US Air Force Space Surveillance satellites that were given a higher priority. The covert Geosynchronous Space Situational Awareness Program, or GSSAP, satellites were only unveiled in Feb. 2014 during a speech by General William Shelton, commander of the US Air Force Space Command. Despite the EFT-1 launch postponement, Kennedy Space Center Director Bob Cabana said technicians are pressing forward and continue to work around the clock at KSC in order to still be ready in time to launch by the original launch window that opens in mid- September 2014. “The contractor teams are working to get the Orion spacecraft done on time for the December 2017 launch,” said Cabana. Concurrently, new American-made private crewed spaceships are under development by SpaceX, Boeing and Sierra Nevada – with funding from NASA’s Commercial Crew Program (CCP) – to restore US capability to ferry US astronauts to the International Space Station (ISS) and back to Earth by late 2017. Read my exclusive new interview with NASA Administrator Charles Bolden explaining the importance of getting Commercial Crew online – here. Stay tuned here for Ken’s continuing Orion, Boeing, SpaceX, Orbital Sciences, commercial space, Curiosity, Mars rover, MAVEN, MOM and more planetary and human spaceflight news. During the stationary recovery test of Orion at Norfolk Naval Base on Aug. 15, 2013, US Navy divers attached tow lines and led the test capsule to a flooded well deck on the USS Arlington. Credit: Ken Kremer/kenkremer.com. NAVAL STATION NORFOLK,VA – When American astronauts again venture into deep space sometime in the next decade, their return trip to Mother Earth will end with the splashdown of their Orion capsule in the Pacific Ocean – much like the Apollo lunar landing crews of four decades ago. But before that can happen, Orion must first pass through a myriad of milestones to insure the safe return of our human crews. A NASA and U.S. Navy test successfully demonstrated the water recovery of the Orion crew module today (Aug. 15) at Naval Station Norfolk in Virginia – and Universe Today witnessed the entire operation. “Today’s test was terrific,” Scott Wilson, NASA’s Orion Manager of Production Operations, told Universe Today in a post test interview at Naval Station Norfolk. US Navy divers on four boats attached tow lines and to the Orion test capsule and guide it to the well deck on the USS Arlington during Aug. 15 recovery test at Norfolk Naval Base, VA.
Today’s ‘Orion Stationary Recovery Test’ was conducted to support the upcoming first flight of Orion on the EFT-1 mission due to blastoff in September 2014 from Cape Canaveral, Florida. “We completed all of our primary and secondary test objectives,” Wilson stated. Teams of US Navy divers in a flotilla of amphibious boats launched from the USS Arlington approached a test version of the Orion capsule known as the boilerplate test article (BTA). The Arlington was docked against its pier during the test in a benign, controlled environment. Divers attached several tow lines to the capsule, in a coordinated operation with the Arlington, and led the capsule into the ship’s flooded well deck. The Orion capsule was carefully towed inside the well deck and positioned over the recovery cradle. The sea water was drained and the capsule was attached to the recovery cradle. “The operation within the well deck areas are also being controlled as well as the rope and winch handlers on the boat,” Wilson told me. At the conclusion of the test, myself and the NASA social media participants boarded the USS Arlington and toured the Orion capsule for a thrilling up close look. “Today marks a significant milestone in the Navy’s partnership with NASA and the Orion Human Space Flight Program,” said Navy Commander Brett Moyes, Future Plans Branch chief, U.S. Fleet in a statement. The ocean recovery of Orion will be far different from the Apollo era where the crew’s were first hoisted out of the floating capsule and the capsule then hoisted on deck of a US Navy aircraft carrier. The next Orion water recovery test will be conducted in the open waters of the Pacific Ocean in January 2014. NASA’s Langley Research Center in nearby Hampton, VA is conducting an extensive drop test program in support of the Orion project. “The Orion hardware and the Delta IV Heavy booster for the EFT-1 launch are on target for launch in 2014,” Wilson told me. The EFT-1 mission will provide engineers with critical data about Orion’s heat shield, flight systems and capabilities to validate designs of the spacecraft before it begins carrying humans to new destinations in the solar system, including an asteroid and Mars. It will return to Earth at a speed of approximately 20,000 mph for a splashdown in the Pacific Ocean. Right now its T Minus 1 Year and counting to liftoff of Orion EFT-1. The Orion spacecraft has gotten a new look for its first launch atop the inaugural flight of NASA’s Space Launch System (SLS) booster on the Exploration Mission-1 flight around the Moon in 2017 as seen in this new animation. The vehicles service module will be built by the European Space Agency (ESA), as a result of a new bilateral agreement between NASA and ESA. Orion is designed to carry humans back to the Moon and to deep space destinations like Asteroids and Mars. The service module will fuel and propel the capsule on its uncrewed journey to the Moon and back on EM-1 in 2017. Read my follow-up report for details about the new NASA/ESA agreement. See my earlier story here, about preparations for the first Orion launch in September 2014 on the upcoming Exploration Flight Test-1 in 2014 atop a Delta IV Heavy. An unmanned Orion will fly on a two orbit test flight to an altitude of 3,600 miles above Earth’s surface, farther than a human spacecraft has gone in 40 years, and then plunge back to Earth to test the spacecrafts systems and heat shield. NASA is also simultaneously fostering the development of commercial ‘space taxis’ to fly astronauts to the International Space Station (ISS) as part of a dual track approach to restore America’s human space launch capability. The 1st commercial crew vehicle might fly as early as 2015 – details here. NASA successfully conducted a drop test of the Orion crew vehicle’s entry, descent and landing parachutes in preparation for the vehicle’s first orbital flight test, currently scheduled for 2014. Orion is the crew vehicle that NASA is building to bring astronauts to new destinations in space. It will be launched on the new rocket being built, the Space Launch System. Unlike the space shuttle, Orion will have emergency abort capability, and won’t be landing on a runway. Instead, the vehicle will splash down in the ocean, like the US capsules in the 1960’s and 70’s. NASA is working to make sure the crews will have a safe re-entry and landing, and the parachute tests help to ensure that. NASA is on course to make the highest leap in human spaceflight in nearly 4 decades when an unmanned Orion crew capsule blasts off from Cape Canaveral, Fla., on a high stakes, high altitude test flight in early 2014. A new narrated animation (see below) released by NASA depicts the planned 2014 launch of the Orion spacecraft on the Exploration Flight Test-1 (EFT-1) mission to the highest altitude orbit reached by a spaceship intended for humans since the Apollo Moon landing Era. Orion is NASA’s next generation human rated spacecraft and designed for missions to again take humans to destinations beyond low Earth orbit- to the Moon, Mars, Asteroids and Beyond to deep space. Orion Video Caption – Orion: Exploration Flight Test-1 Animation (with narration by Jay Estes). This animation depicts the proposed test flight of the Orion spacecraft in 2014. Narration by Jay Estes, Deputy for flight test integration in the Orion program. Lockheed Martin Space Systems is making steady progress constructing the Orion crew cabin that will launch atop a Delta 4 Heavy booster rocket on a two orbit test flight to an altitude of more than 3,600 miles and test the majority of Orion’s vital vehicle systems. The capsule will then separate from the upper stage, re-enter Earth’s atmosphere at a speed exceeding 20,000 MPH, deploy a trio of huge parachutes and splashdown in the Pacific Ocean off the west coast of California. Lockheed Martin is responsible for conducting the critical EFT-1 flight under contract to NASA. Orion will reach an altitude 15 times higher than the International Space Station (ISS) circling in low orbit some 250 miles above Earth and provide highly valuable in-flight engineering data that will be crucial for continued development of the spaceship. “This flight test is a challenge. It will be difficult. We have a lot of confidence in our design, but we are certain that we will find out things we do not know,” said NASA’s Orion Program Manager Mark Geyer. Lockheed Martin is nearing completion of the initial assembly of the Orion EFT-1 capsule at NASA’s historic Michoud Assembly Facility (MAF) in New Orleans, which for three decades built all of the huge External Fuel Tanks for the NASA’s Space Shuttle program. In May, the Orion will be shipped to the Kennedy Space Center in Florida for final assembly and eventual integration atop the Delta 4 Heavy rocket booster and launch from Space Launch Complex 37 at nearby Cape Canaveral. The Delta 4 is built by United Launch Alliance. Continued progress on Orion, the SLS and all other NASA programs – manned and unmanned – is fully dependent on the funding level of NASA’s budget which has been significantly slashed by political leaders of both parties in Washington, DC in recent years. Production of NASA’s first space-bound Orion crew module has at last begun at NASA’s Michoud Assembly Facility (MAF) in New Orleans – that’s the same facility that for more than three decades was responsible for manufacturing the huge orange colored External Tanks for the just retired Space Shuttle Program. The first weld of structural elements of the Orion crew cabin was completed by Lockheed Martin engineers working at Michoud on Sept. 9, 2011. This marks a major milestone on the path toward the full assembly and first test flight of an Orion capsule. This state of the art Orion vehicle also holds the distinction of being the first new NASA spacecraft built to blast humans to space since Space Shuttle Endeavour was assembled at a California manufacturing facility in 1991. Eventually, Orion crew modules with astronaut crews will fly atop NASA’s newly announced monster rocket – the SLS – to exciting new deep space destinations beyond low Earth Orbit; such as the Moon, Asteroids and Mars. The first unmanned Orion test flight – dubbed OFT-1 – could come as early as 2013 depending on the funding available from NASA and the US Federal Government. NASA is still deciding which rocket to use for the initial test flight – most likely a Delta 4 Heavy but possibly also the new Liberty rocket proposed by ATK and EADS. The framework welds were completed using the same type of friction stir welding (FSW) process that was implemented to construct the last several of the 135 Space Shuttle External Tanks at MAF that flew during the shuttle program. Friction Stir Welding creates seamless welds in the Aluminum – Lithium alloys used for construction that are far stronger and more reliable and reproducible compared to conventional welding methods. 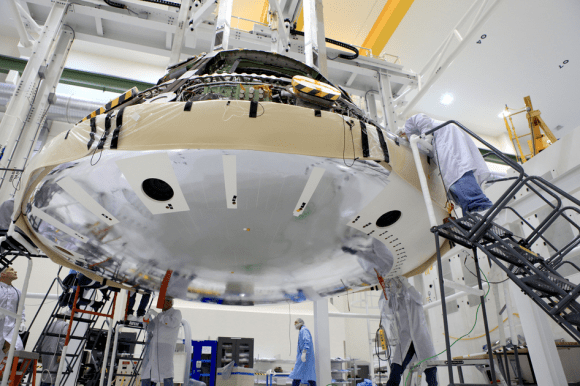 Orion spacecraft will be manufactured at Michoud in New Orleans, Louisiana, then sent to the Operations & Checkout Facility at Kennedy Space Center for final assembly and integration prior to launch. Lockheed Martin is the prime contractor for Orion. The vehicle was recently renamed the Orion Multipurpose Crew Vehicle (MPCV) after being resurrected following its cancellation by President Obama as a key element of NASA’s now defunct Project Constellation “Return to the Moon” program. The first crewed Orion won’t launch until the 2nd flight of the SLS set for around 2020 said William Gerstenmaier, NASA Associate Administrator for Human Exploration and Operations (HEO) Mission Directorate, at an SLS briefing for reporters on Sept. 14. Lockheed has already built an initial version of the Orion crew capsule known as the Orion Ground Test Article (GTA) and which is currently undergoing stringent vibration and acoustics testing to mimic the harsh environments of space which the capsule must survive. Watch for my upcoming Orion GTA status report. Assembly of NASA’s first Orion Crew vehicle that could actually launch to space has been accomplished by prime contractor Lockheed Martin Corporation at the firm’s Waterton space systems facility located near Denver, Colorado, where the spacecraft is slated to begin a severe testing process that will help confirm crew safety. Orion is NASA’s next generation spacecraft designed to send human crews to low Earth Orbit and beyond to multiple deep space destinations throughout our solar system including the Moon, Mars and Asteroids. Orion was recently recast as the MPCV or Multi Purpose Crew Vehicle in the NASA Authorization Act of 2010. “The first Orion crew module built to spaceflight specifications is complete,” said Linda Singleton, a spokesperson for Lockheed Martin in an interview. Watch this cool and detailed animation of the testing process to be conducted at the Reverberant Acoustic Lab at Lockheed Martin’s Waterton Facility. The video also shows how the Orion will be integrated and tested with the Launch Abort System (LAS) that would save the lives of the astronauts on board in the event of a spaceflight emergency. With the Grand Finale of NASA’s Space Shuttle Program now just days away after the launch of shuttle Atlantis on the STS-135 mission, the US faces a gap with no capability to send humans to space and the International Space Station for a time period extending at least several years. A replacement vehicle for the retiring shuttle – whether its the Orion or from a commercial provider like SpaceX – can’t come soon enough in order to maintain the viability of the International Space Station. This Orion vehicle also known as the Ground Test Article, or GTA, will now be subjected to several months of rigorous flight like testing that simulates the harsh environments that astronauts would face during voyages to deep space. Thereafter, the Orion crew module will be transported in early 2012 to NASA’s Langley Research Center in Virginia where it will undergo water landing drop tests next year at the new Hydro Impact Basin facility. A Delta IV Heavy booster rocket is the most likely candidate for the 2013 Orion orbital flight, but a final decision has not yet been announced by NASA. Meanwhile, another Orion crew module that was flown during the Pad Abort 1 test (PA-1) in 2010 is now on public display at the Kennedy Space Center Visitor Complex in Florida. The vehicle just arrived after a cross country trek from NASA’s Dryden Flight Research Center in California and making several public outreach stops along the way to Florida. The Orion PA-1 test article is on display until July 4 in the historic Rocket Garden at Kennedy in the shadow of a mighty Saturn 1B and alongside Mercury, Gemini and Apollo Era capsules and rockets. The mockup of the LAS is also still on display at the Kennedy Visitor Complex.